This guide to embroidery by both hand and machine offers practical advice on equipment, materials, methods, and techniques. Includes step-by-step instructions, practice projects, and an illustrated stitch directory. The book is lovely and does include some simple projects to try at home yourself. 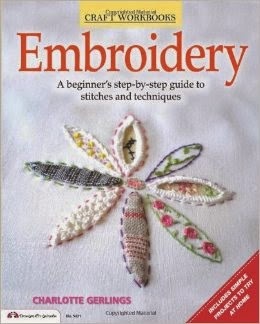 The book is informative and has a section on European folk embroidery as well as Regional embroidery. You can get it on Amazon or at a good book shop with a craft section. I got mine from Amazon. With simple instructions and step-by-step diagrams including charts and templates, the Arcturus Craft Workbooks series are highly accessible and practical guides designed with the absolute beginner in mind, but also suited to those who would welcome a refresher in these most popular crafts. The crafts covered in this series are timeless, creative and rewarding. They have seen a recent surge in popularity as people look to save pennies and return to a more traditional 'make do and mend' outlook on life. Each book includes specific projects for readers to get stuck into, with straightforward instructions and large, clear illustrations. With a section about choosing the right equipment, glossary of terms and abbreviations and even a section on after care of your handmade products - as well as including both UK and US terminology - this is the perfect starter series that caters for all.